Last week we finally got featured with Bycatch on Boingboing and Fast Company thanks to our invitation to the XOXO festival. It is amazing to see what that attention does and what kind of effect that has on sales. Now that we have finally arrived in the English speaking world we can relax a bit and keep pushing out the marketing we had planned all along. I would be curious to see whether something similar happens at some point for Japanese and Chinese speaking online communities. This is turning into a traffic blog more than anything else. After taking stock of the plans for the new Maaßenstraße which is very slowly nearing completion, now let’s take a look at another place close to my heart: Moritzplatz. The square is right underneath my office and as such I cross it several times daily both on foot and by bike. A couple of weeks ago week an accident took place there where a cyclist was touched by a car. No big deal in his case, but it could have been worse considering the way motorists behave here. I have to pay close attention every time I cross this roundabout otherwise this could happen to me as well. Two weeks ago they started marking what is to be the revamped Moritzplatz. I had my hopes up that it would be a serious improvement but judging from the plans it is mostly going to be a new paint job. The paint job will separate the bicycle lane with stripes from the car lane narrowing the space the cars get and widening the space the bicycles get. The cycle lane itself will be painted bright red. Cycling on the new markings and adhering to the new situation is a bit weird but it does feel like it’s going to be an improvement. It is however not going to fix the most important problem with the square. Cyclists get their lane doubled in width and protected by markings. Whether that protection will mean anything in reality remains to be seen. Cars in Berlin will drive anywhere they please. What is a bigger problem on this roundabout and what will remain so in the new situation is that it is unclear who has precedence on the points where cyclists and cars have to cross each other. The angle with which the two cross has also remained the same so you really have to pay attention not to hit a cyclist and not to get hit by a car. 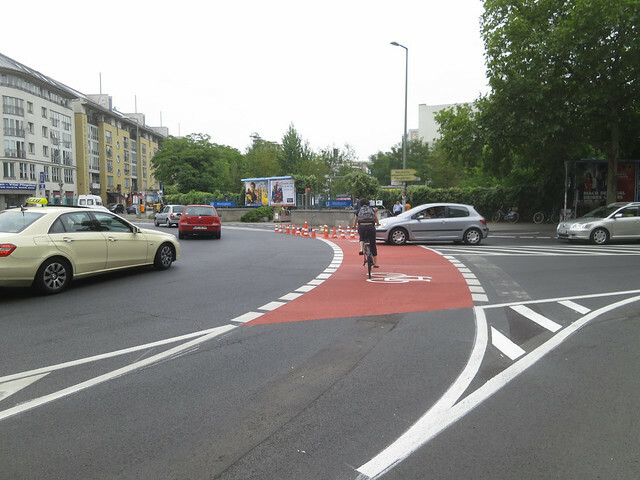 A real solution would have been to mark the roundabout with Sharks’ teeth and maybe even to elevate the cycle path. That way cars entering and leaving the roundabout notice that they do so physically. Physical separations on the road make the power dynamic a little less unbalanced like you can see in this example from California. They are of course also expensive. 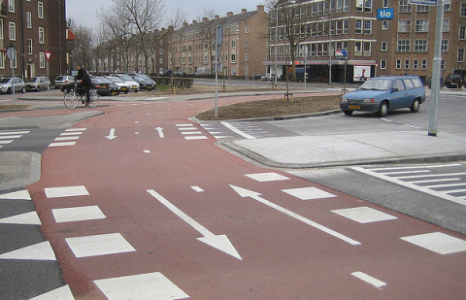 There are roundabouts in the Netherlands that are laid out this defensively even though that usually is not necessary. Pedestrians around Moritzplatz have really been shafted and they are getting a tiny improvement in the new situation. For a pedestrian there is no safe way to cross the square. The underground crossing through the U-Bahn station does not count. Going down and up stairs isn’t an option for disabled people and it’s too much effort for most people in general. Traffic should be safe for its weakest participants so that it benefits everybody. 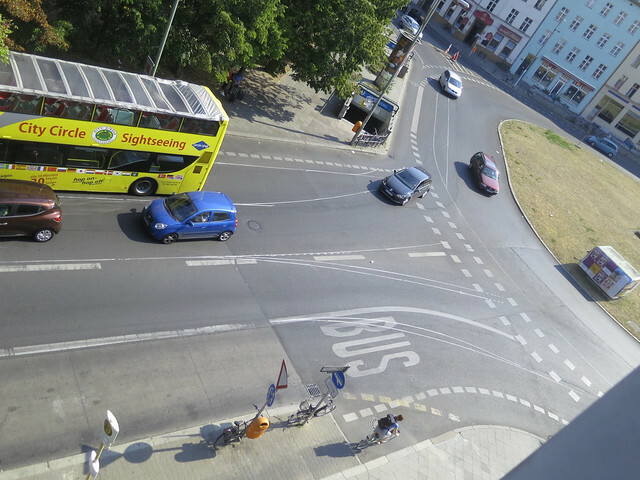 Let’s take a look at the various options to cross Moritzplatz. Keep in mind that you will often have to cross at least one arm of the roundabout to get anywhere. West – There is no way to cross the road here except for the traffic light at Stallschreiberstraße. This traffic light feels broken for pedestrians because during rush hour it gives you about 12 seconds to make the crossing. Almost nobody makes it across during the green phase and everybody knows that the red phase takes forever so people also cross when it’s already red. 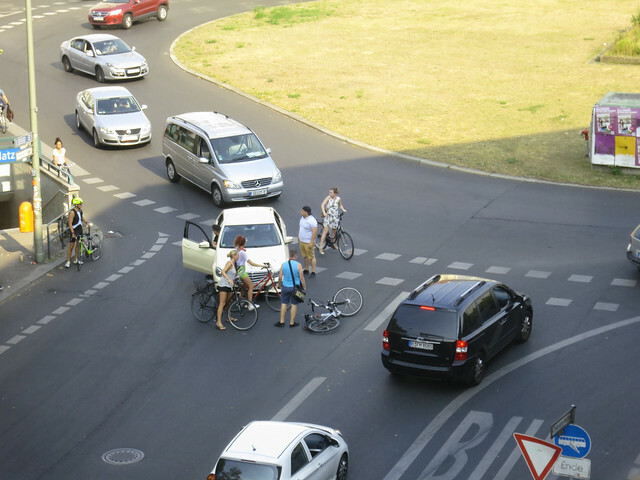 The traffic light is not an option for crossing Moritzplatz since it is 50m away. That is too far. North – On this side there is an island in the road where pedestrians are relatively safe so at least they don’t have to make the entire crossing in one go. It is still unsafe because there isn’t a zebra crossing but it’s better than nothing. 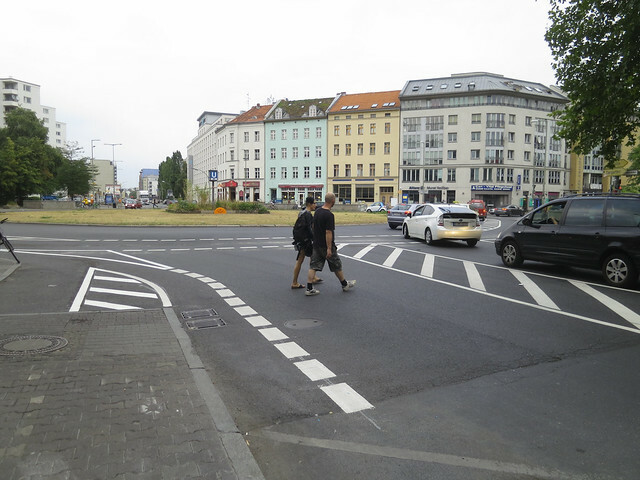 East – There is no way to cross here except for the pedestrian crossing 50m down Oranienstraße. South – A new pedestrian island is planned here. Unfortunately it is 15m off the main arm but that is better than 50m. Just like at the other islands, there won’t be a zebra crossing there which makes any pedestrian trying to cross still a potential victim. It doesn’t matter if there is no way to cross the road, people still do of course. Even if you pay attention and cross the road when there is no traffic, incoming cars expect to be able to push you off the road. At which point you are forced to run across or be killed. The main flaw here is that people shouldn’t be forced to walk ten or fifty meters more to make things more convenient for motorized traffic. People are more important than cars. Update: The work is nearing completion and actually the new markings do not seem to make that much of a difference except to cause everybody on the square to be fairly stressed out. I guess this adequately describes all of us. @alper I admit that I am in despair over the cycling policy that I rejoice in this silly markings. 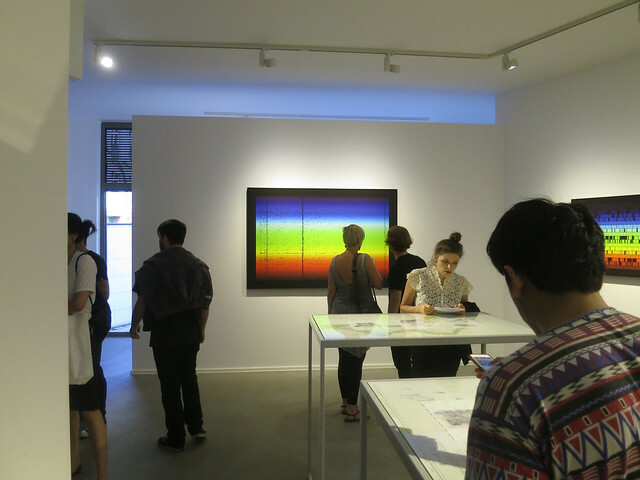 A couple of weeks ago already, James Bridle opened his first solo show The Glomar Response at NOME gallery here in Berlin. The opening was attended by more or less everybody I got to know when I first got to Berlin, a reunion of sorts. The exhibition is a collection of recent work and is still exhibited there for this entire month. James is one of the few artists who creates thoughtful work from the conflation of state power and information technology. His work is only made stronger by the writing that underpins it which is all worth reading and listed neatly over on booktwo. 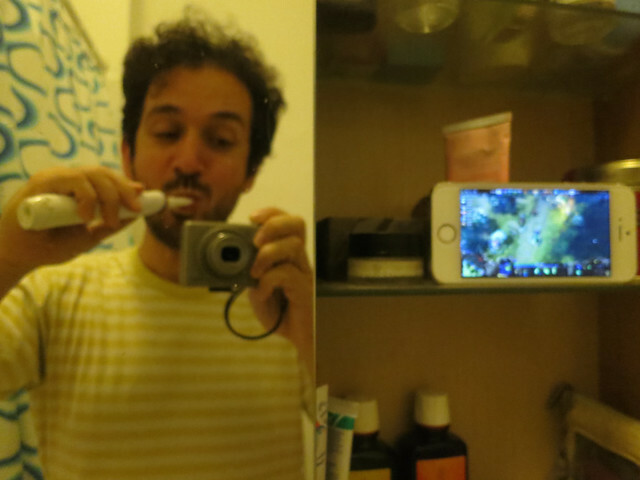 This was my situation for most of last week watching The International main event take place thanks to the time difference. The event this year was bigger and better than ever before both in its organization and in the level of play that was displayed.